The Ukulele is a well-known music instrument originating in a sunny sub-tropical and volcanic island in the middle of the Ocean. The island is famous for its dense and lush vegetation and its fertile volcanic soil. Many vegetables and fruit sorts grow effortlessly on the island. This piece of land was known for its sugar cane culture. It is also appreciated for its laid-back lifestyle and its fabulous surfing spots. Furthermore, the island is home to many species of whales and dolphins. Many cruise ships dock during the Winter months and it is a tourism paradise for both the active and leisure tourists. Take a guess! 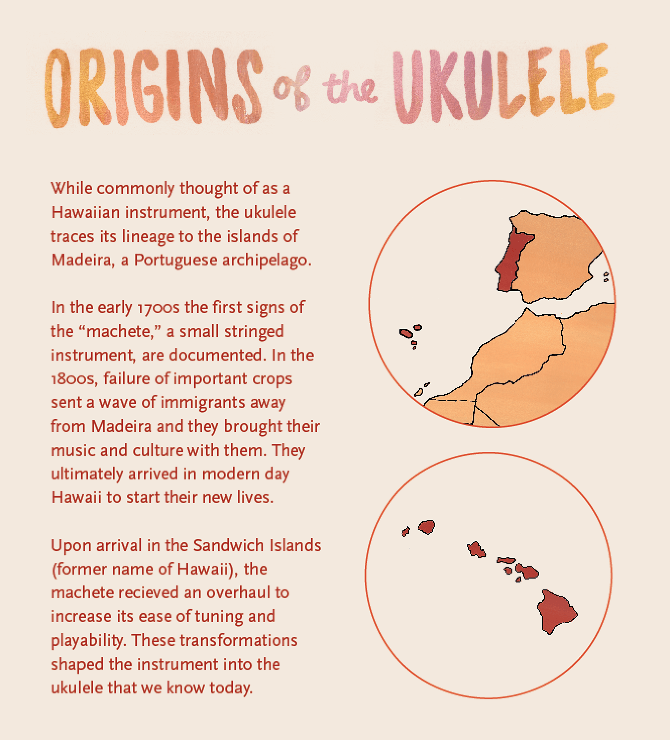 Where did the Ukulele originally come from? Easy right! Hawaii? No, Madeira of course! Yes really. 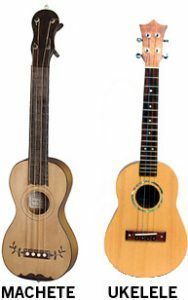 The ukulele stems from Madeira, Portugal. A few hundred years ago, musicians in the street of Funchal and other parishes played a small, guitar-like string instrument with four cords called the braguinha or machete. In the middle of the 18th century, Madeira was a rather poor island. However, across the world, the sugar industry was booming in what is now called Hawaii. Hawaii was in desperate need for labor and approximately 25 thousand Madeirans immigrate to Hawaii to work in the sugar cane fields. Those Madeirans also took their favorite instrument along and began enchanting Hawaii with the music of their strange instrument. 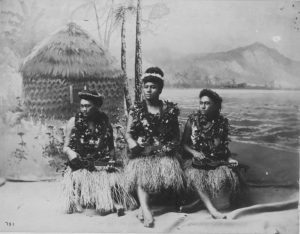 Native Hawaiian hula girls playing the ukulele popularize in the reign of King Kalakaua. Three woodworkers from Madeira, Manuel Nunes with Augusto Dias and Jose do Espirito, started crafting machétes. The first ukuleles appeared less than a decade further on Hawaii. The wood essence is the main distinction between the two instruments. 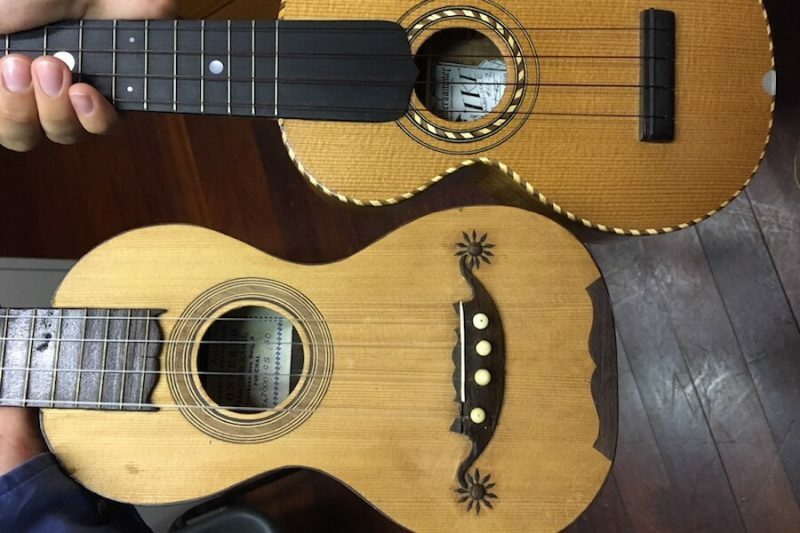 The ukulele became very popular thanks to Hawaii’s last King, David Kalakaua and his wife. Queen Liliuokalani wrote the emblematic and famous “Aloha Oe” song on a ukulele. Listen to that marvelous song here below. From one Paradise island to another. From the Machéte to the Ukulele. Enjoy!